The SpiritLessons / DivineRevelations website has researched and collected many face to face visitations with Jesus Christ, to specifically find out exactly what the Lord is speaking Today. In these visitations, there is a very consistent message that God is giving His people. Many other organizations have also thoroughly researched what God is speaking to His people today. (Including FireOnTheAltar SidRoth InsightsofGod.com Jacob's Well ExtremeProphetic ) They are also getting a very consistent message. The message given from the book series CONVERSATIONS WITH GOD is absolutely NOT consistent with what Jesus Christ is revealing through visitations, prophetic words or Scripture. We recommend that you do NOT put your faith in this book series by Mr. Walsch. 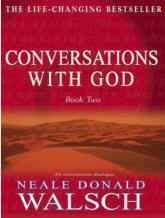 His books contradict the Actual Divine Conversations given through many people, which are consistent with scripture. The People of God need to seriously pray for the Lord's judgment on the book series CONVERSATIONS WITH GOD. And that it does not lead people astray.